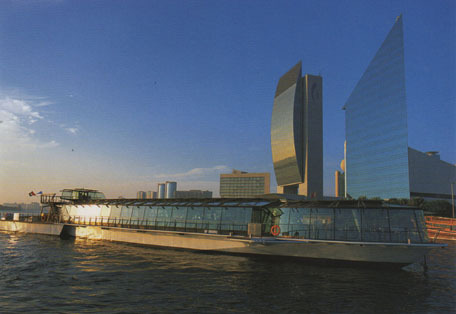 From Bateaux Dubai’s glass-enclosed interior, you will be able to see a variety of Dubai’s most famous landmarks. Created by Seine Design, France, Bateaux Dubai seamlessly combines cuffing- edge technology and optimal comfort. It is equipped with a full-service kitchen rivalling any to be found on land, enabling all meals to be prepared onboard for immediate enjoyment. Guests are treated to unobstructed views from all seats thanks to the anti-reflective glass enclosure. A hi-tech air-conditioning system ensures maximum comfort, while a top-end sound system delivers a superb acoustic experience. Bateaux Dubai also incorporates a host of environmentally friendly features that ensure it produces no effluent, while reducing noise and exhaust emissions. Freshly prepared gourmet cuisine, an extensive selection of beverages, contemporary classic music played by the DJ, modern decor and personalized service make a luxury cruise aboard the elegant Bateaux Dubai as inspiring as the city itself. Not only can you step aboard one of Bateaux Dubai’s public cruises seven days a week, but chartering the vessel tor your very own private event will give you the opportunity to be at the helm of an extraordinary and unique cruise experience tailored to your own requirements. The expertise and extensive catering experience of Bateaux Dubai’s specialized event professionals will ensure that your tailor-made cruise is a spectacular and unforgettable occasion.